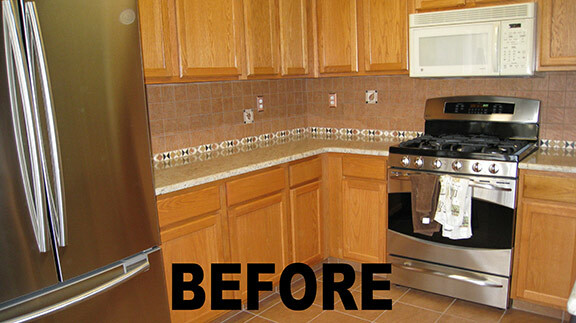 Don't believe a simple cabinet refacing upgrade can save your kitchen? Pshaw! We'll show you what's up! 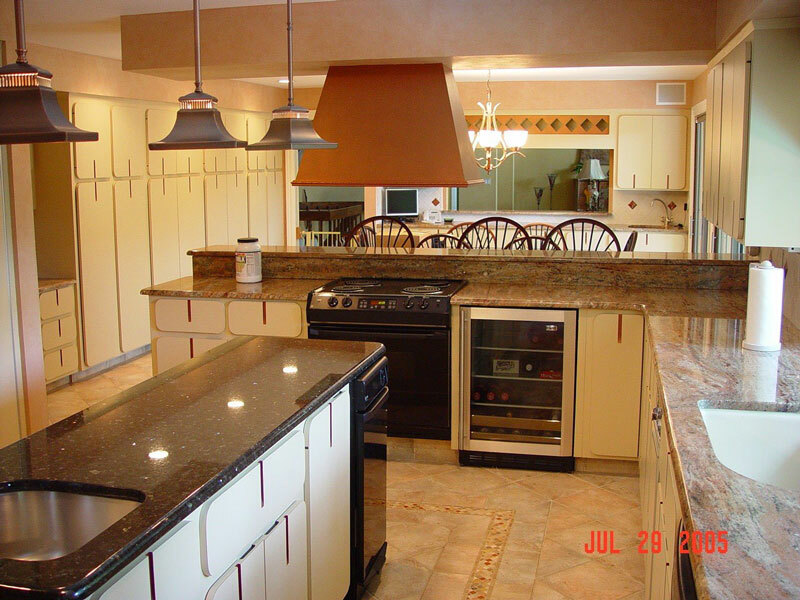 These 10 miraculous kitchen updates, all designed and executed by Kitchen Magic, are living proof that an affordable kitchen refacing job is all you need to pull your kitchen out of a bygone era and into your contemporary reality. 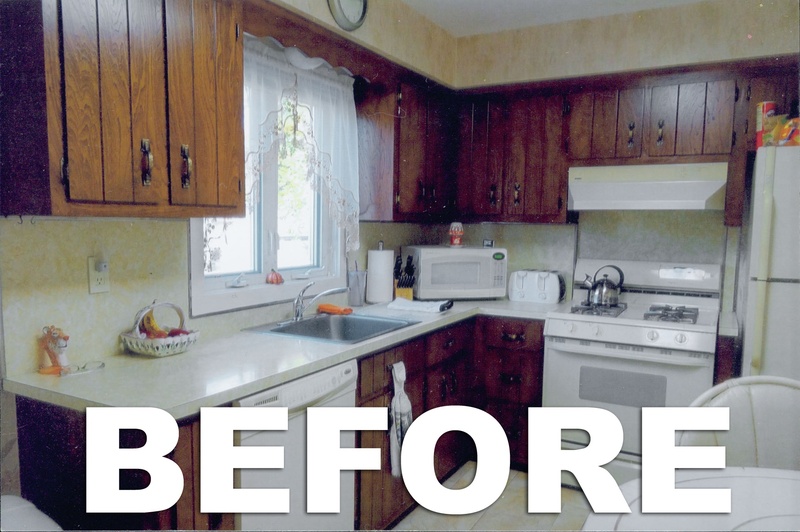 Oooh and Aaaah: These Cabinet Refacing Jobs Will Make You Jealous! Keep in mind that nothing was changed other than the cabinet faces. 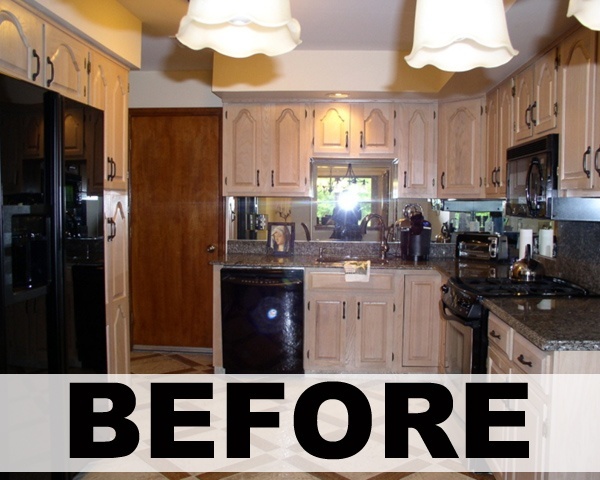 All we did was eliminate outdated or boring-to-them cabinet doors and replaced the cabinet faces with new ones. Easy-peasy! 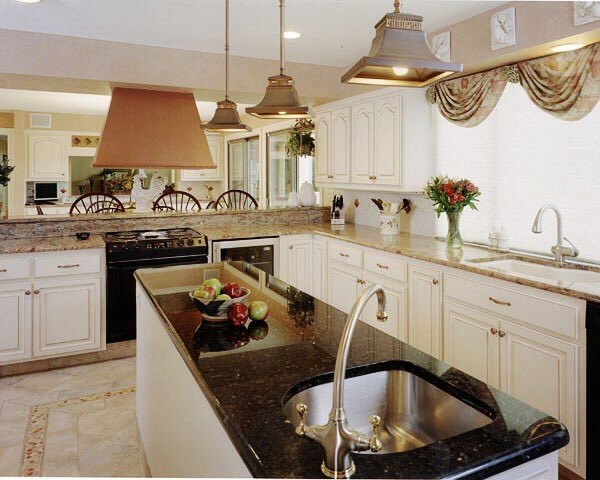 These white cabinets had a cool aesthetic but, alas, the mustard-hued granite didn't have the intended warming effect. In fact, it almost went to an unattractive puce! 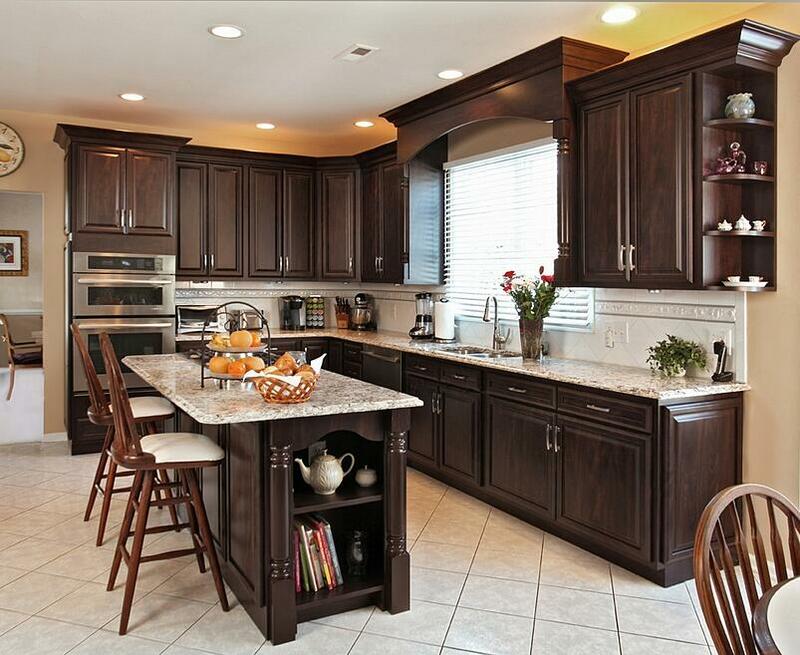 We refaced the cabinets with our Prestiage Raised Panel Chocolate Pear and now the kitchen is warm and inviting. 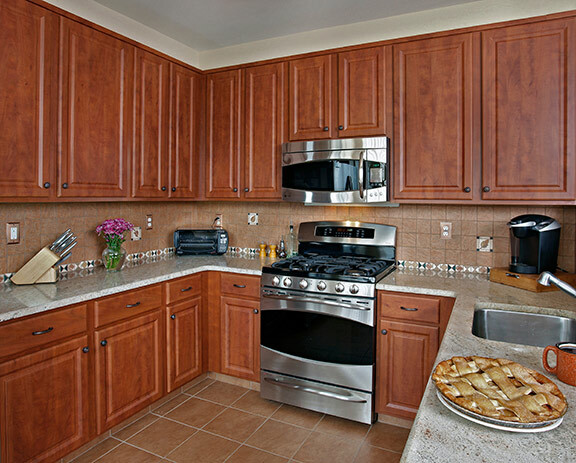 Plus, the updated tile backsplash and floors pair beautifully with the new quartz countertops. The original oak, cathedral cabinet doors in this kitchen were decidedly dated and just didn't "work" with the somewhat new granite. The oak made the cabinets appear shabby. We switched them out for Statesman style doors in Barnwood, with modern bar-style pulls, and the effects are ultra-luxurious. This kitchen was lost in dated oak surroundings. 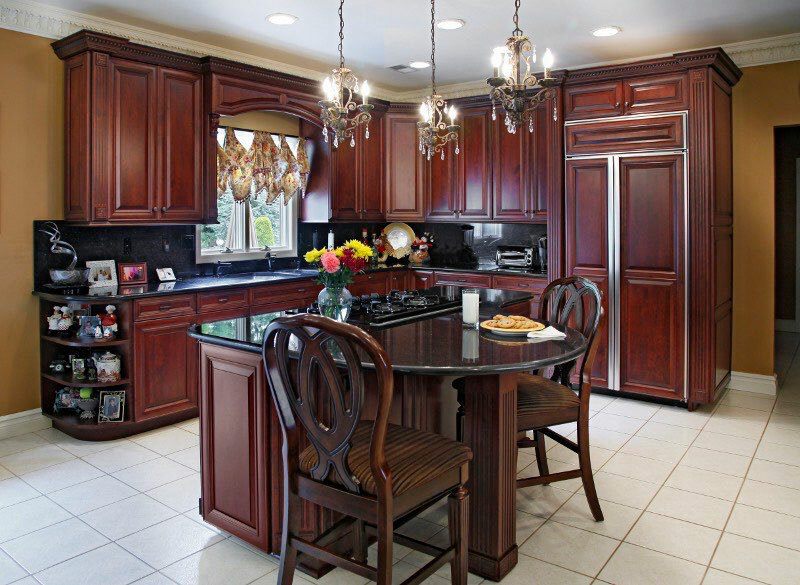 We brought it back from oblivion by adding Classic Raised-Panel Doors in an Washington Cherry glaze for a decidedly substantial and effect that provides a firm anchor for the open concept kitchen. 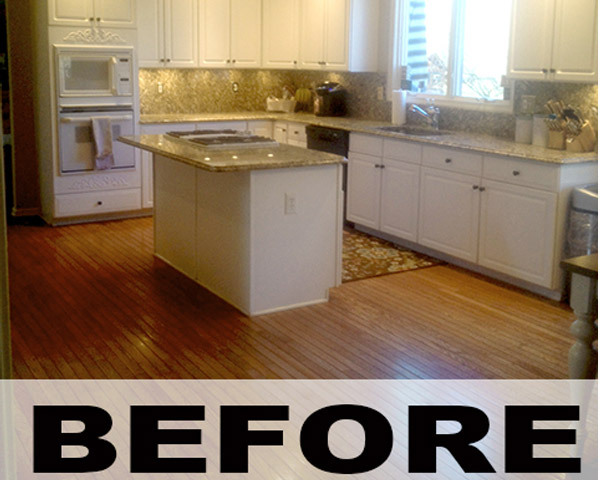 Here is an example of how small changes can have a dramatic impact. For this refacing project, we switched out the truly builders-grade shaker style doors to a more traditional style in Vintage Raised Panel in Antique White with Brown Glaze. 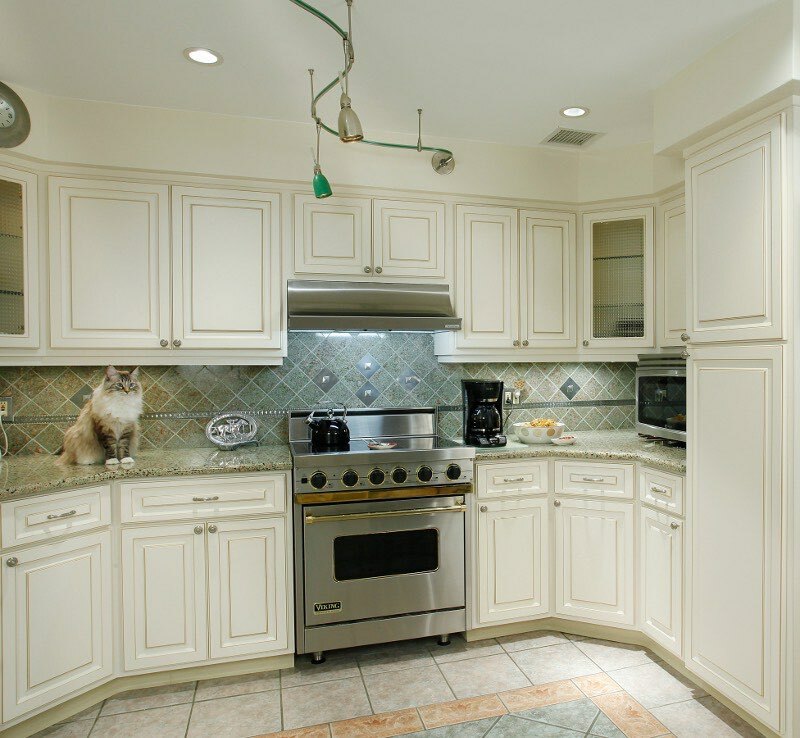 The refaced cabinets are now in style with the rest of the home's motif. Vintage Raised Panel Doors are a timeless look and will stand the test of time. Yes! 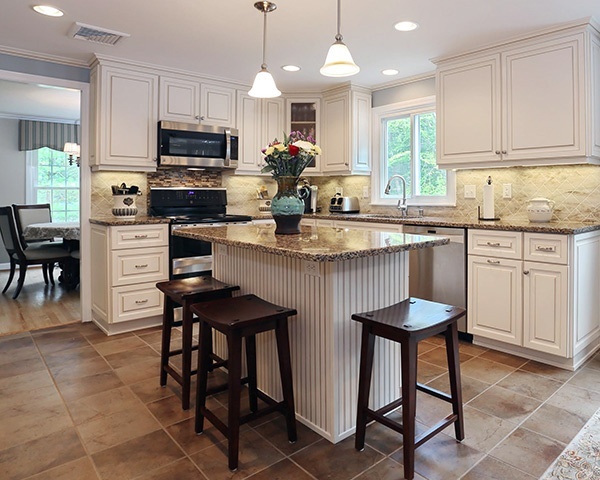 A singular cabinet refacing project can change the entire style of your kitchen, making your modern kitchen look traditional again. The addition of Breckenridge Cathedral Doors in Mucumeci After Antique White with a Walnut Glaze make this open kitchen space go from "Can't Touch This!" to "Come on in, get cozy and let's toast with a cuppa Chamomile tea!" Is that a fabulous transformation or what? 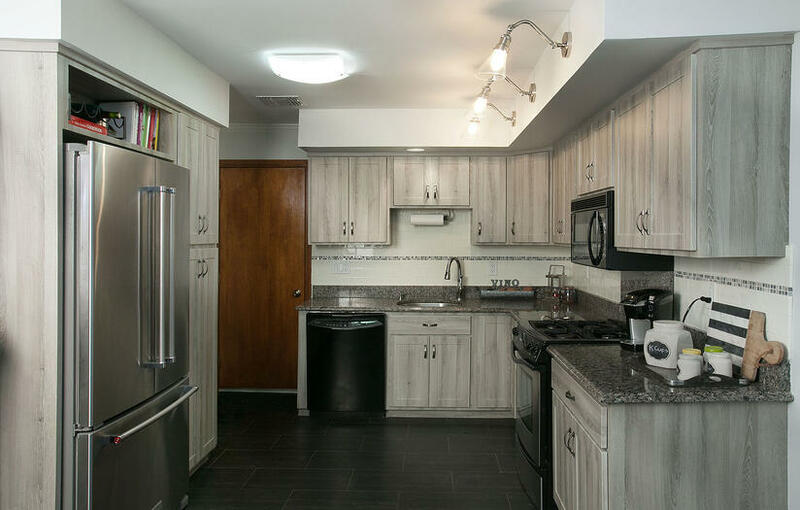 While we don't necessarily advocate the use of cosmetic enhancements, we feel this kitchen is sort of like the cabinet refacing equivalent of an anti-aging and energizing Botox injection. There were broken drawer glides and the finish on the otherwise attractive cabinets was just a little "blah." 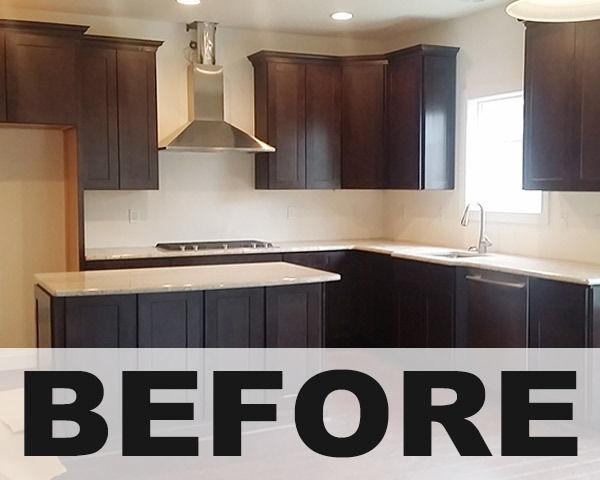 So, we updated the cabinets with Antique White with Walnut Glaze in our Breckenridge doors, this refacing transformation shed a decade-and-a-half in no time flat. New tile work is expensive and unnecessary if you're smart about your kitchen remodeling choices. 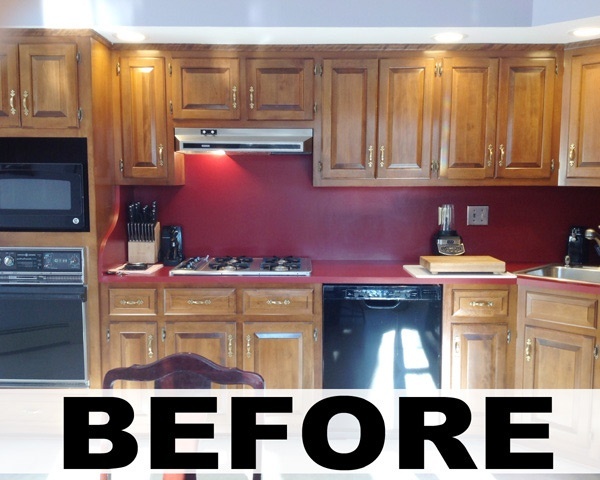 By replacing late 80's oak cabinets with Prestige Square cabinet doors in a warm and bright Cherry finish - all of a sudden outdated tile work becomes relevant again. The kitchen went from Family Ties to Modern Family in just a couple of days. 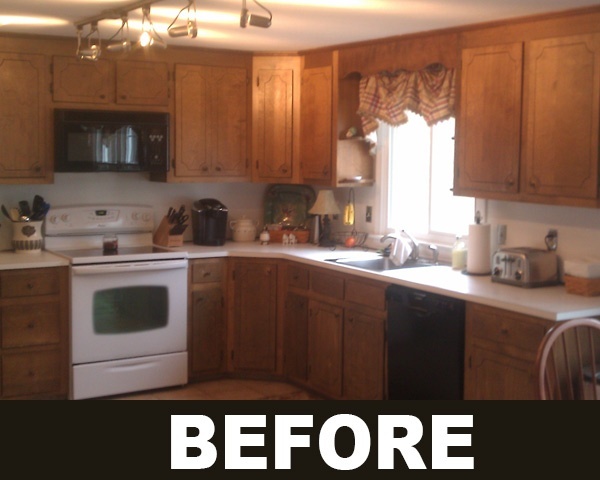 The old cabinets, mixed with that earthy wall color, made the kitchen seem dimmer and dingier than it really was. Light is important in a kitchen. Well-lit spaces feel bigger, cleaner and more cheerful. While this kitchen had access to plenty of natural light, the overall effect was still gloomy. To fix that, we installed Breckenridge style cabinet doors in our popular Antique White with Walnut Glaze. 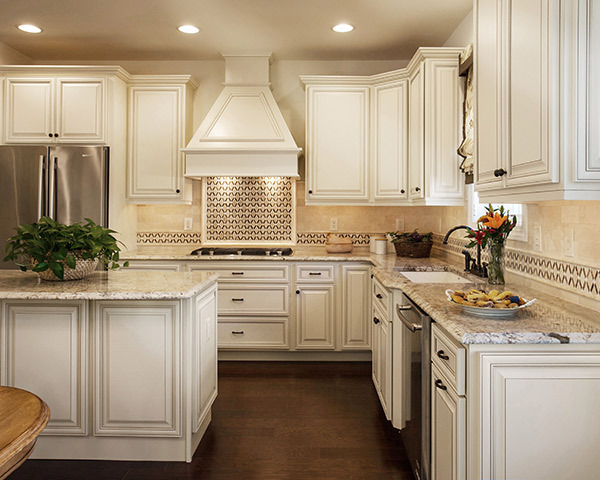 The mix of cabinet door and drawer styles is perfect for this transitional kitchen. 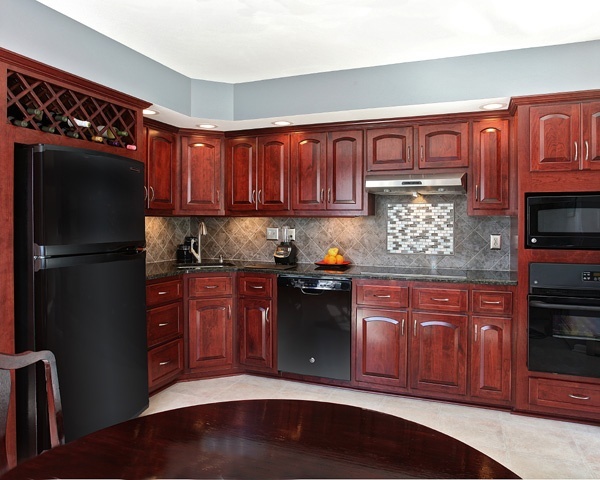 Another bonus: the cabinet color brought out the warmer tones in the wall color. As you can see, the overall effect is much brighter. Black-and-White kitchen motifs are classic, but when combined with a mish-mash of accents, it results in a big fat style mess, laden with empty calories. Blech! We decided to pare things down using Classic Raised Panel doors, which provide plenty of visual interest in Cordovan Cherry. Then we finished them with a Sable glaze for added richness and depth. Now you have the eye candy you're looking for without any empty calories. A stylized kitchen can be great, but often ends up overstaying its welcome. 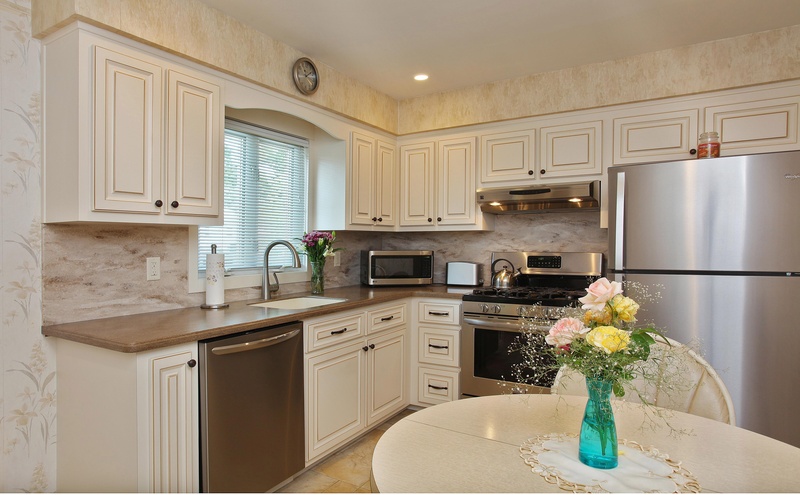 That's why these owners were ready to ditch the green and slip into something a little more comfortable and neutral, like Breckenridge Square cabinets in Santangelo After Antique White with a Walnut Glaze. 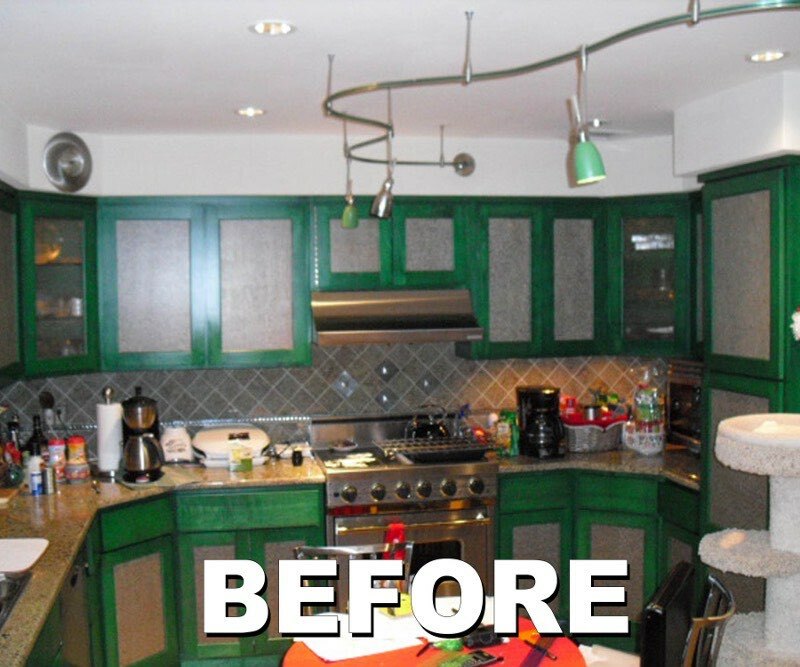 Did these 10 miraculous kitchen transformations make you green with envy? 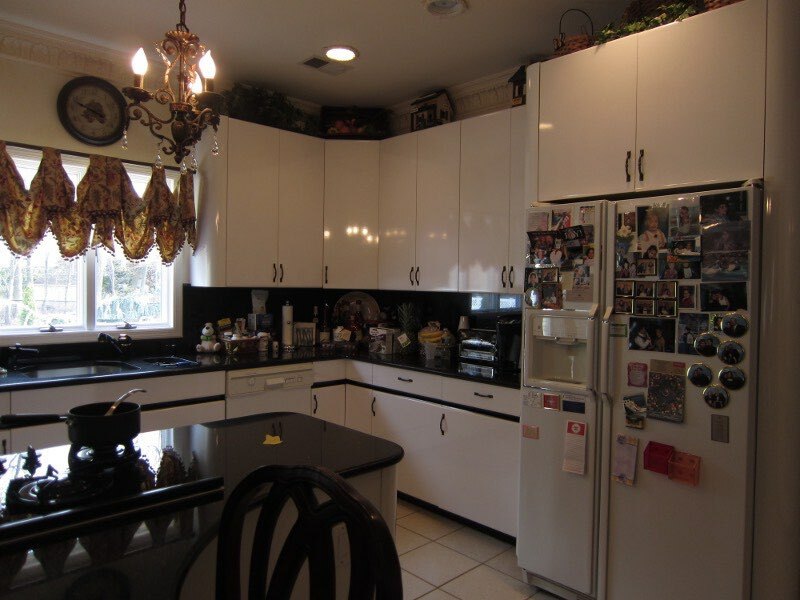 Then contact Kitchen Magic so we can come over for an on-site consultation and cabinet refacing estimate.